Click here to see a list of many of our other customers. We’ve decided to offer some free consulting using our Call Center Designer and SimACD tools. We can do staffing scenarios free for you to analyze how many people you need at each time period of a given work week to meet your service levels, or to see what happens to your service levels if you are either under or over staffed. Just call us at 208-263-6776 and we’ll arrange for you to send us the call volume data we need and we’ll do some work for you. Is there an ulterior motive? Sure there is. We’d like you to see what our software can do for you so that you might choose to buy it someday, and to also consider our AgentTime call center scheduling software. Telephone traffic along with other forms of traffic, such as automobile traffic, share similar characteristics. Traffic may be very busy and have to slow down and wait, or it may be very light with little slowing or blockage. Facilities such as roads, telephone lines, toll booths, service agents, and bank tellers may be either under or over utilized causing costly idle time or poor service to customers. Call center workforce managers face a daily, continual challenge in finding the right number agents to use at the right time to handle calls that arrive in a random manner. This paper explores why this challenge occurs and two methods used to meet it. 2. Keep the time callers have to wait to an acceptable minimum. The inbound call center is a customer/server/queuing system: customers (calls), arrive in the system to be served by servers (agents or operators), but may have to wait (in queue) for them. Almost a century of mathematical study has gone into the problem of “arrivals” that need service by a “server”. A simple minded approach to determining the number of agents needed in a particular hour might be to take the number of calls expected to arrive in the hour, multiply that by the average minute length of all the calls and then divide by 60. As an easy example, if 60 calls arrive in 1 hour, each with an average length of 1 minute, you might say that you only need one agent with a single telephone line to answer all the calls. The obvious flaw to this sort of logic is that call arrivals in the real world are not distributed one right after the other. The average arrival rate in the above example is 1 minute, but their actual arrival is distributed randomly: some will come in at the same time, some will come in when another is being served, and during some periods of the hour no calls may arrive at all. Also, the length of the calls follows a random distribution. These random distributions are determined by the laws of probability. It’s a bell-shaped distribution skewed out to the right. It says that at any given moment, the probability of what the time will be to the next call arrival is “scrunched up” in front of the average time to the next call arrival, and tapers off slowly thereafter. The “hump” of the curve is before the average time to the next call. 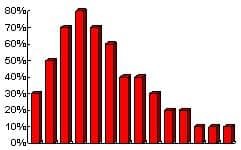 If the hump was right at the average time to the next call arrival (a normal distribution), then call center staff planning would be far easier than it is. Thus, the relationship between how busy your agents are and the service your callers get is not a simple linear relationship. In other words, you can’t gauge the level of service your callers are getting be peeking over the cubicles and checking out how busy your agents are over some given time period. And, there are break off points where the addition or subtraction of one or two agents will result in dramatic differences in customer service level as evidenced in the average speed to answer and average queue time in queue graphs above. This runs counter to our common intuition, but it is true. This distribution says that the most probable call lengths are those that are less than the average call length, but that there are going to be some that are a whole lot longer. This phenomenon also contributes to a “clumping effect”: the length of calls in progress at any given time may all be rather short or all be rather long, but will very seldom be close to the average length of all the calls experienced in a day. To complicate things even further, the average time that callers spend in queue is also exponentially distributed around the average queue time primarily because a large percentage of callers hang up very quickly when they get the “please hold” message. A simulation method that imitates the flow of calls into a call center and their handling by agents, with queuing, blocking, and overflow. The most common method used for call center staffing is formula using the famous Erlang equations (Erlang C and Erlang B) for staffing and trunking. They compute the probability of delay in queue for calls when using a given agent level with a given amount of inbound call traffic. The software in the various call center staffing and scheduling products that calculate the Erlang C formula calculate it for several agent levels and then pick out and tell the user the one agent level that gives a delay probability closest to that of their desired service level. These products will do this for each hour, half hour, or quarter hour time period throughout a workday. So, in the formula method, the user inputs number of calls, talk times, and wrap-up times for each period of time in the workday, along with the desired service level (e.g., answer 80% of calls within 20 seconds). The software calculates the Erlang equation and pops out optimum agent levels for all time periods in the day. It can also be used to observe the effects on queuing and agent workload when using different agent levels in any one time period. Modified versions of these formulas, with the ability to specify desired queue levels, are used in Portage Communications’ Call Center Designerô Day Planner, Staffing, and Trunking software modules. In fact, most all of the staffing and scheduling software for call centers use the Erlang formulas or some minor modification of them. The Erlang analytical method has done a good job over the years in helping call center managers determine what agent levels they should use. However, it does not account for some of the unique dynamics of inbound call centers using an ACD, and it tends to over-staff many call centers to some degree. The most talked about shortcoming of the standard Erlang C formula is that it assumes calls will queue up infinitely and wait forever to be answered by an agent. For centers with limited inbound line capacity and callers with little queuing tolerance, the Erlang method may not be accurate enough. Also, what about caller abandonment (hanging up after being queued), or callers retrying after abandoning or getting a busy, or the ACD overflowing calls to another agent group? And what about that ACD ring delay feature (the number of rings the caller can be given before the ACD picks up the line)? Some companies and mathematicians have derived “special versions” of the Erlang method that claim to at least partially account for some of these issues especially the infinite queuing problem. However, no tweaking of the equation will fully take into account any of the issues mentioned above, much less all of them. Some of the variants out there to the Erlang C equation are highly suspect, having no published analysis of their mathematics, and may actually give less reliable staffing predictions. If a call center manager finds that in practice Erlang C is not allowing them to maintain their desired service levels to the degree they want, or that it calls for many more agents than are actually needed, then they should probably just skip all the Erlang variants and analytical equation methods and try the second method:simulation software. So what is computer simulation? Most people have heard of weather and climate forecasts made by computer simulations, or maybe they have played computer games like SimCity. Industrial and natural processes may often be simulated by a computer program. 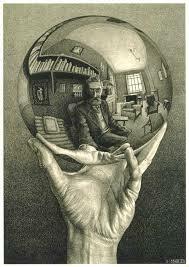 The program imitates the flow of people, material, or events and is used to experiment and see what the effects that alternative configurations of the people, material or events would have on a real-world situation. In the past few years simulation programs have become an increasingly popular method for call center staffing and performance prediction. A call center or ACD simulator compresses a day’s worth of incoming call traffic into a short period of time by representing each second of a day with a few microseconds of computer time. Calls are made to randomly arrive in a “virtual” call center created in the computer’s memory and are answered by agents, queued, met with busy signals, overflowed, or abandoned depending on the parameters, agent/trunk combinations, and call volumes defined for the call center. 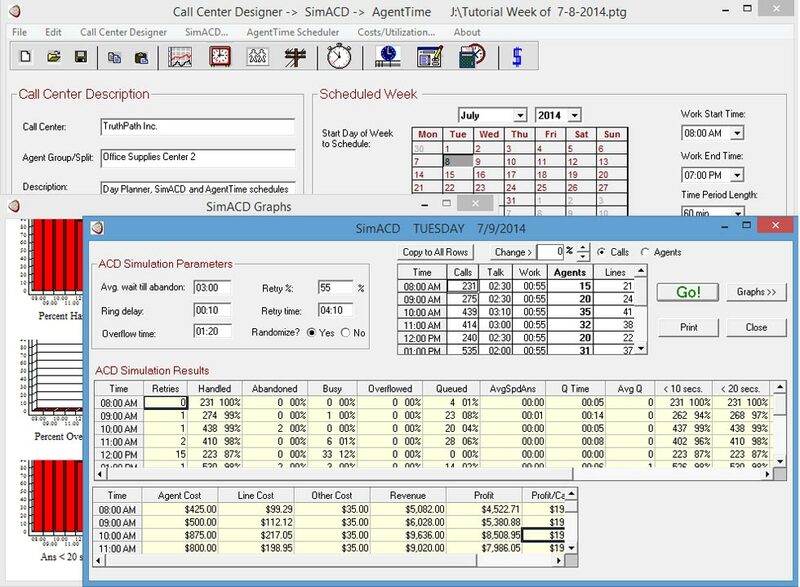 The simulator doesn’t just calculate equations in the way that a formula does, rather, it actually acts as an experimental call center that reacts to the random arrival of inbound calls with the agent and inbound line levels, inbound call volumes, caller abandonment and retry behavior, and ACD overflow the call center manager wants to test and try out. Simulation can then accurately predict the levels and effects on service level of call blockage, abandonment, caller retries, and overflow when these are entered as parameters to the simulation. Also, a simulation program can make the random call arrivals and call lengths follow the Poisson and exponential distributions that are seen in the real world. At the end of the simulation, you will see how many calls were handled, abandoned, given a busy, queued, and overflowed along with queue lengths, average speed to answer, and the actual service levels that would be given to your callers. More simulations with different combinations of agents and trunks are usually performed until the manager is satisfied with the service levels, agent work load, and call center finances. A good way to state the difference between the Erlang formula method and the simulation method is this: with the formula method, you enter your call volumes and what you want to happen in the form of the desired service level you want to maintain, and you are told what number of agents and lines you need. With the simulation method you enter the number of agents and lines you want to use along with your call volumes, and you see what will happen in the form of service levels actually given. One drawback of simulation is that it can take longer to determine your optimal agent levels. The Erlang formula’s output is an optimal agent level: you only need to run it once. With you have to test and try out different agent levels and see what happens. Are the resulting queue levels acceptable? Are the agents busy enough? Is the service level sufficient? No? Then adjust the agent and line levels and run another simulation, and another, and maybe another. This extra work pays back in what will be more accurate and practical predictions of optimal agent levels and call center performance. Also, you can see values for calls queued and overflowed, the number of callers who abandon or get busies and the calls that retry later. Portage Communications makes SimACD an automatic call distributor simulator that takes into account such dynamics as ring delay, call abandonment and retry behavior, and overflow. It simulates a full workday by the hour, half hour, or quarter hour, and displays both numeric and graphic predictions for such items as calls, handled, queued, overflowed, busy, retried and more. It also gives average speed to answer times, queue times, and percentages of calls answered in less than ten, twenty, thirty, and sixty-second intervals. It is the call center industry’s first affordable simulator designed for smaller call centers or agent groups. What Method Is Best For Your Call Center? If you require staffing predictions to do simple scheduling and just need reasonably accurate levels to on which to base your agent schedules, then staying with Erlang C or an Erlang variant will probably fit your needs. Practically all of the existing workforce management systems use an Erlang formula for calculating the required number of agents, and these requirements are then fed into a scheduling algorithm and agent database to create work schedules. Erlang C also works well with most of the home grown spreadsheet based scheduling systems that many call centers have developed independently. Problems occur if your call center is more complex. If you have multiple agent groups, skills based routing of calls, overflow of calls from one group to another, or auto attendant and IVR systems that handle some of the calls, then simulation becomes the better option since these dynamics cannot be represented in a mathematical formula. However, at present, there are hardly any simulation software products that handle these and are combined with a scheduling module in the same package. Many companies are working on one (including Portage Communications), so look for them in the near future. Most call center managers use Erlang and simulation staffing methods for call center performance analysis in addition to agent scheduling. They want to see what they’re predicted queue levels and agent work load will be at varying agent levels. Analysis of call center performance is especially helpful in taking a close look at your call center’s busiest hours, least busy hours, and other problem periods. For performance analysis, you don’t want an Erlang formula tool that just spits out a required numbers of agents based on a given service level goal. You want a tool that will also tell you what your average speed to answer, percent queued, average queue length, agent occupancy will be. These and other performance measures are important to study in order to determine what your service level goal should be in the first place. Simulation software will also give these measures for call center analysis and is more accurate. Also, as already stated, simulation can take into account caller abandonment, retry behavior, ACD ring delay, and overflow. On the minus side, call center simulators can be very expensive primarily because this type of software is difficult to write, and the market for them is still very new. Determining the optimum number of agents and the effects of different agent levels is the key to a smoothly running call center and happy callers. The dynamics of modern call centers require managers to explore all the new formula and simulation software to meet this challenge. Stuart Harris is the President of Portage Communications, Inc. He has worked in the telecommunications and call center industries for over thirty years and holds a BA in Mathematics and Computer Science from the University of Colorado, and an MS in Software Engineering from Seattle University. May be used with permission only.